We've had a chance to spend a little time with Apple's new laptop offerings, and we wanted to give you a taste of what's changed -- and stayed the same -- in the MacBook and MacBook Pro. Included after the break is a rundown of our impressions. We're going to be doing a longer, fuller, more exciting review in the very near future, but this should give you an idea of what to expect if you're planning on diving into one of these anytime soon. If you just want to get into the heavy stuff, you can hit the galleries below for a thorough look at the hardware. If you're wondering why the color temperature seems to vary in the photos, we shot it at the Revision3 studios while filming a segment for Tekzilla and they kept changing the lights (lovely folks, lighting changes notwithstanding). While much of what you see on the outside here is the same as the MacBook Pros that you're used to, the construction is totally new, and you can feel it. Both the MacBooks and the MacBook Pros feel almost exactly like what they're made out of: solid slabs of high-grade aluminum. The overall construction feels amazingly tight and secure, and they've smoothed some of those hard edges, making them seem sleeker than before. 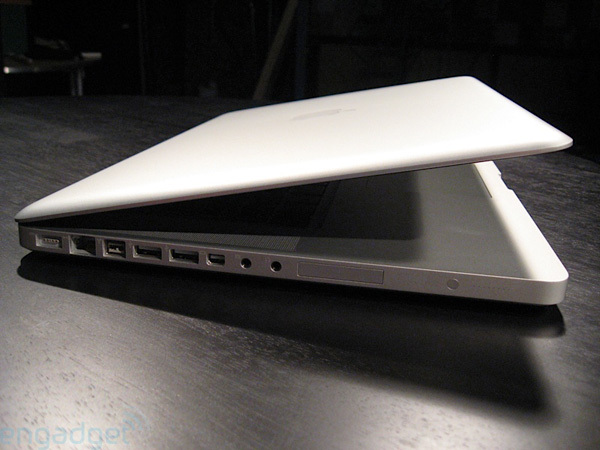 While the MacBook has shaved off nearly a half-pound of weight from the previous iteration, the Pro has fattened up two-tenths of a pound over the earlier model. Of course, the other big news is that Apple has traded up from the displays we've come to know and love in previous models for an iMac-esque super glossy, matted (but not matte -- we'll get to that) LCD screen. The company has also seen fit to remove the button from the trackpad altogether, making the entire surface a Storm-like single button, albeit one that can be tweaked via software for multi-finger gestures. But let's just get it out right here -- four finger gestures may be pushing it a little far. 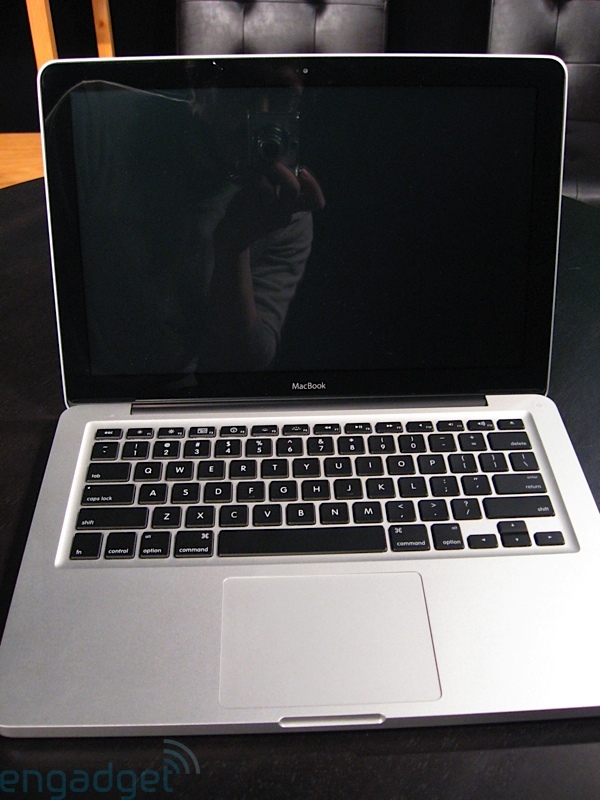 The screen presents a particularly vexing problem; Steve Jobs has stated that this is the direction which Apple is going in for all new models (ostensibly based on the outpouring of love from consumers Phil Schiller mentioned at the event), and there aren't plans for non-glossy versions. Unfortunately, that doesn't work for everyone. In particular, users who take their work outdoors, or don't have full control of every lighting situation they're in will be left hanging -- to say nothing of people who just don't want to look at their reflection all day. It's not quite a deal-breaker, but it does annoy to know Apple isn't concerned with users who would prefer a less reflective surface. 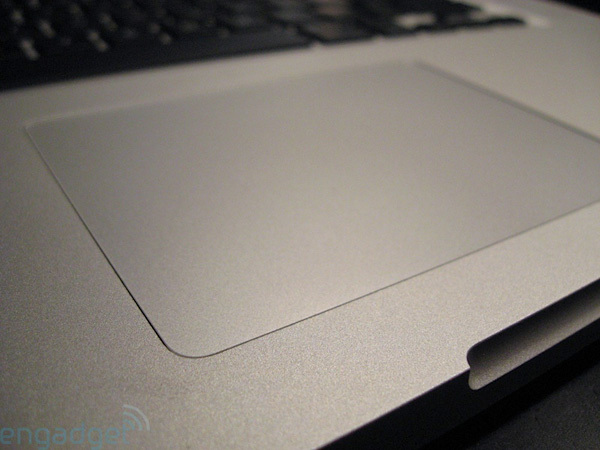 The trackpad, on the other hand, is surprisingly usable. The click feels similar to the traditional button -- though slightly more resistive -- and you're able to right-click with either a two-finger gesture or by assigning one of the bottom corners. We prefer the latter technique, we just hope someone hacks that to expand the corner size. They tell us it's made of glass now, but it feels pretty much the way it always has. All-in-all, not a bad execution on something we were fairly worried about. You can see a video of it in action below. Besides the big cosmetic changes, Apple has killed the Firewire 400 slot (there's an 800 present on the Pro), swapped the DVI port for a mini Display Port jack (adapter definitely required), and moved all the rest of the ports to the left side of the machines. They've also mercifully put that battery level on the side now, thus alleviating the need for flipping your computer over. 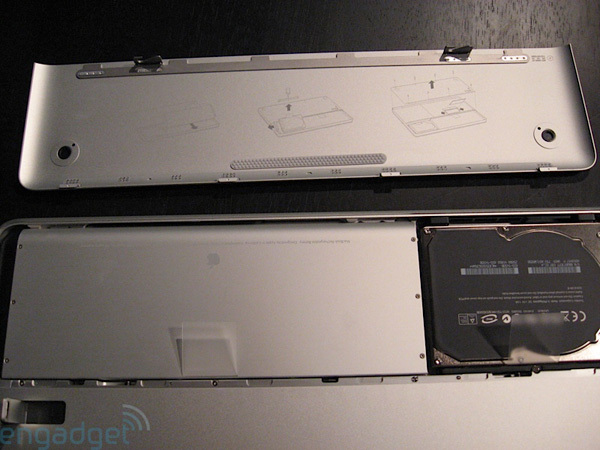 And speaking of the battery, Apple now puts it in an easy to access covered section along the bottom / back which also allows access to your hard drive. This definitely makes it easier to pop out your drive, but the RAM is actually a little harder to get at (you'll need a screwdriver). It works, though we wish they'd made changing the memory as easy as changing the disk. And in case you're wondering, the batteries aren't transferrable between the two systems. As before, MacBooks with MacBooks, and Pros with Pros. Under the hood, there's been spec bumps galore, including faster CPUs for both (up to 2.8GHz for the MacBook Pros, up to 2.4GHz for the MacBooks), DDR3 RAM is now in play with both systems, and on the Pro you'll get that pair of NVIDIA graphics chips, the GeForce 9400M and 9600M GT. You can switch those up depending on your needs, but you'll have to logout to make the changes stick. The MacBooks just sport the 9400M, but if you're looking for a powerhouse, you're probably looking towards the Pro anyhow. The software obviously remains the same besides new trackpad options, graphics chip switching, and other minor changes (that we've seen so far), though there are some odd tweaks. According to Jason Snell from Macworld, you can use your iPhone earbud button to control iTunes (pause / play, back and forward), and the microphone can be used as a... microphone. It's a strange but nice touch. Overall, this is evolution, not revolution, but there are some very welcome updates here. We're still wishing for a few things, like EV-DO or HSDPA built-in, but we're not at all let down by what Apple is showing off. We'll tackle these in a longer review later, but for now you can enjoy these pics and the details we scraped together.